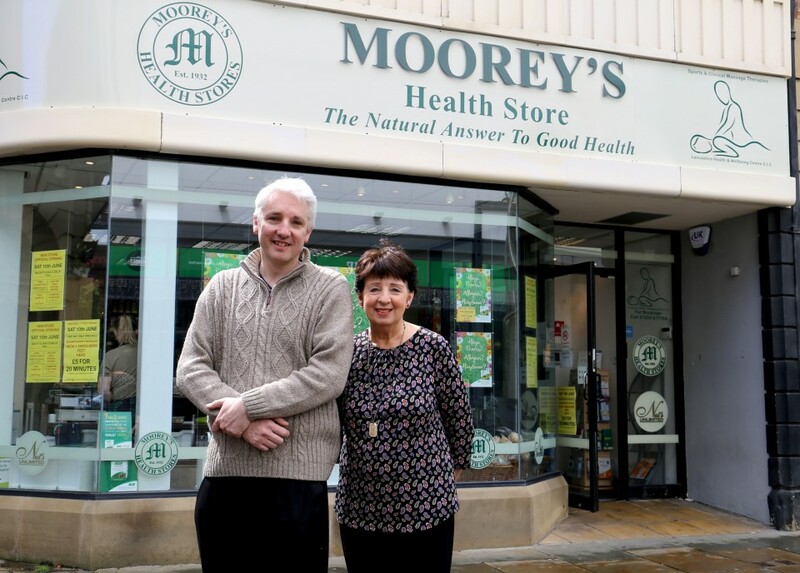 Moorey’s Health Store, which opened in 1932, has moved into brand new premises on Church Street and now offers two floors of health foods including vegetarian and vegan frozen foods, vitamins and homeopathic remedies. The shop has also partnered with the Lancashire Health and Wellbeing Centre, which has opened a clinic teaching massage therapy in the store. said Wayne who started at Moorey’s as a Saturday boy, aged 12. He now runs the shop with his aunt who took over from the original owner Captain Moorey, a family friend, and who was originally based in premises opposite what is now Morrisons supermarket. Moorey’s later moved to the six day market in the 70s and the three day market a decade later. The new shop has been open for two months and the move was supported by Blackburn with Darwen Council with a £7,000 grant towards renovations on the empty property through a scheme that aims to encourage businesses to take on vacant premises in both Blackburn and Darwen town centres. In addition, the Council made some improvements to the walkways along Temple Court between Church Street and the Cathedral Grounds to encourage visitors to the shop including improving lighting with new signage soon to be installed. Wayne who has won awards for his in store health advice and has also written five books on alternative therapies says the move has given the already popular business an extra boost. We were doing well previously but now we’re welcoming new customers every single day, which is amazing consider we’re 85 year’s old! Moorey’s is a fantastic success story and has become a real fixture of the town centre so we were delighted to support them when they said they would be interested in taking over this previously empty shop. A key part of the Council’s strategy for Blackburn and Darwen town centres is to encourage great businesses like this one to take on empty shops and ensure that we have a vibrant and varied mix of independent and locally owned retailers alongside the high street brands.